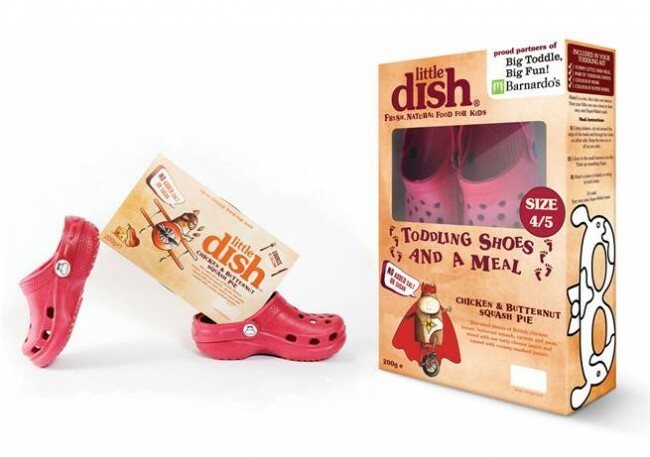 In support of their partnership with Barnardo’s Big Toddle, Little Dish are going to be selling special packs of their Chicken and Butternut Squash Pie with a pair of toddling shoes for just £5. The limited edition packs will be available in Sainsbury’s from Wednesday 23rd May. They come in three different shoe sizes – small 4/5; medium 6/7; and large 8/9. The Big Toddle is a mini sponsored walk for children, and is the biggest fundraising event in the UK for Under 5’s. Definitely worth looking for one near you, or even organising one yourself. Little Dish are also organising a party and picnic in Holland Park, London on Tuesday 22nd May, featuring a toddle to raise money for Barnardo’s. There’s going to be fun stuff for all the kids (and parents too) with party games provided by Sharky & George, including fun races, tug of war, face-painting, t-shirt making, music sessions and story time. More information will be coming soon about how to register on the Little Dish website. You can find out more about the Barnardo’s Big Toddle and how to register here, and find them on facebook. If you would like to win your very own pair of toddling shows, just complete the rafflecopter form below. the fish pie is lovely! We’ve never tried any, sorry! Love those shoes – how I wish F could wear shoes like these! Her little feet have been boiling in her clumpy special boots this week. Chicken Korma, and I love it when Ry doesn’t eat his dinner so I can wolf it down. Heh heh! Di Coke recently posted..A Right Royal Round-up! i havent tried any of their dishes myself, but my daughter has, her favourite is the chicken risotto.